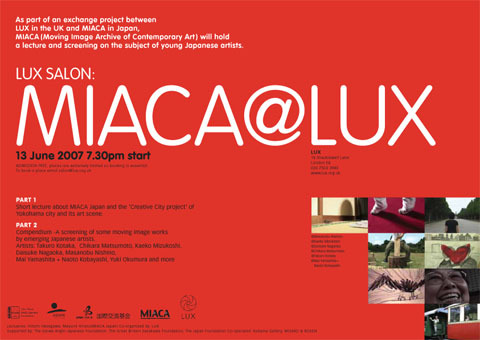 The event, started by Benjamin Cook, the Director of LUX, introduced MIACA. The first part was a lecture about “Creative City project” by Yokohama city that MIACA is involved in. 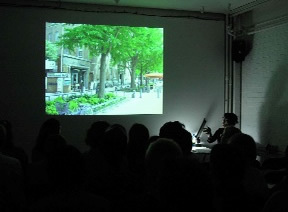 Hasegawa spoke, showing some pictures of ZAIM, Bankart, Yokohama Triennial and others. 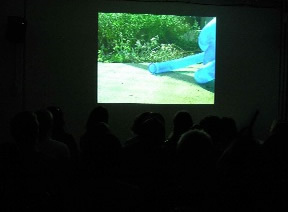 The second part was a screening program titled COMPENDIUM. There is a boom of “Cool Japan” all over the world centering Japan’s subculture including Manga and animation film industry. Besides the movement, however, art scene in Japan conceives different schema. Far from the Cool Japan movement, many of the young contemporary Japanese artists are creating art pieces within an intimate everyday life of their own practices. The second theme is Twisted Reality includes Tetsushi Higashino’s scratch from TV soap opera, Takehiro Iikawa’s mischievous trick themed human’s perception of chronological time. In Karatsu’s video, anybody can play piano in the digitally edited moving image. They all attempt to manipulate or change existing norms in today’s world by using moving images that the artists can totally reign over. The third theme is Drawing Animation, animation with drawing. Daisuke Nagaoka and Chikara Matsumoto made animation with their drawings. They both create animation with hand drawings which is quite labour-intensive and low tech that against today’s rapidly developing technology. 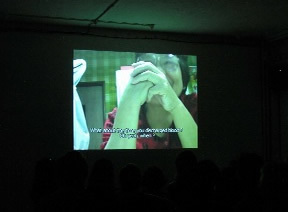 The final theme is Japan, Takuro Kotaka’s BABAISM is about his grandmother and her strange and funny stories, intimate relationship with her grandson, the artist. Kaeko Mizukoshi made a work at Yasukuni Shrine that is condemned by China and Korea because it enshrines spirits of the war dead including A class war criminals of World War II. 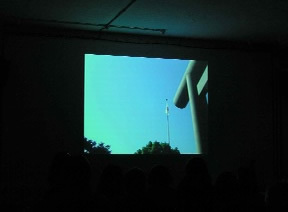 In the film, the shrine’s gate into sanctuary Torii symbolically appears in mid-summer blue sky, reminds us a memorial day,15th August of 70 years ago when the War ended. In all works the intimate everyday life materials or people surrounding the artists are central themes. Their intimate and micro narratives show the complex of joy of indulgence and power of their own lives, vulnerability and reconciliation towards complicated outer world and global relevance. 1, Nishino Masanobu hose 2007 1'11"
2,Nishino Masanobu Chop Wood 2006 0'24"
3, Mai Yamashita + Naoto Kobayashi Miracle 2004 3'00"
4, Yuki Okumura Loop Hole 2006 2'01"
5, Yuki Okumura Count Down NY 2006 1'42"
6, Mai Yamashita + Naoto Kobayashi It's a small world 2004 3'30"
7, Tetsushi Higashino After Soap Operatic 2006 5'23"
8, Takehiro Iikawa Half Time 2007 8'40"
9, Tetsuya Karatsu Piano Lesson 2005 2'45"
10, Daisuke Nagaoka a poem of blind alley 2005 4'23"
11, Chikara Matsumoto Heavy Metal 2005 4'06"
12, Takuro Kotaka BABAISM 2005 7'49"
13, Kaeko Mizukoshi Falling between equal and near equal 2005 10'46"
After the screening, Kaeko Mizukoshi, who is a participating artist talked about her work. 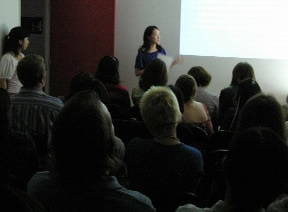 We talked with several people at the reception, and learnt that there were many professionals in the audience. 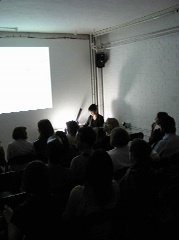 We really appreciate the audience who came and the LUX as a distinguished host and co-organizer of the project. We will hold a screening and a lecture inviting LUX director Benjamin Cook to ZAIM this November. Please join us!